Retail is an enormous and profitable industry. Global sales were projected to top $24 trillion in 2015 and are expected to grow another 3.2% this year, making the magnates who run the sector’s largest companies even wealthier. We recently released our list of the 50 richest people on earth based on data from Wealth-X, which conducts research on the super wealthy. Three people in the top 10 are in retail — including the visionaries behind Zara, Amazon, and IKEA — and 12 others cracked the list as well. To find the wealthiest people in the world, Wealth-X looked at its database of dossiers on more than 110,000 ultra-high net-worth people and used a proprietary valuation model that takes into account each person’s assets, then adjusts estimated net worth to account for currency-exchange rates, local taxes, savings rates, investment performance, and other factors. We narrowed that list down to just the billionaires in the retail industry. Even at 80, Leonardo Del Vecchio still chairs Luxottica, the nearly $30 billion company he founded in 1961. The largest eyewear company on the planet, Luxottica not only owns Sunglass Hut, Ray-Ban, and Oakley, but also manufacturers glasses for nearly every luxury brand out there, including Burberry, Chanel, Prada, and Versace. Though Del Vecchio started Luxottica as a tiny one-room enterprise in Milan, it now operates 10 factories worldwide, employs 35,000 people, and produces more than 65,000 pairs of glasses per day, holding a veritable monopoly on the eyewear industry. Del Vecchio isn’t all business, though. Last March, he showed his generous side by giving his Italian employees $10 million worth of shares in the company to celebrate his 80th birthday. Dieter Schwarz joined his father’s food-wholesaling business in 1973 and opened the company’s first discount supermarket shortly thereafter. He took over as CEO when his father died in 1977 and rapidly expanded the business outside Germany, rebranding the company as Schwarz Gruppe. The parent company umbrellas Lidl, a successful grocery-store chain and the second largest in Germany behind Aldi, and Kaufland, a chain of “hypermarket” stores similar to Walmart. Lidl has nearly 10,000 stores across 26 European countries and is set to break ground on US soil in 2018. Schwarz Gruppe now pulls in $85 billion in annual sales. The German billionaire lives a quiet life out of the spotlight with his wife and two kids in their hometown of Heilbronn. He’s reportedly a generous donor to educational causes. 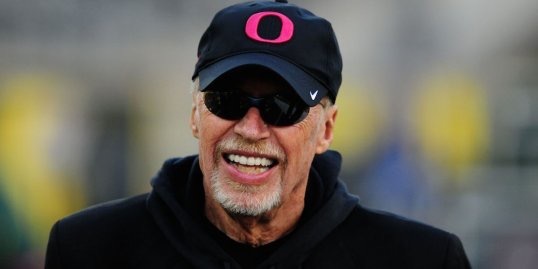 After a stint in the US Army, and with a Stanford MBA under his belt, Phil Knight convinced Tiger-brand shoemaker Onitsuka in the early 1960s to allow him to distribute Tiger shoes under the name Blue Ribbon Sports — the name Knight picked that predated his swoosh-logo-clad company Nike. Knight worked full-time as an accountant as he launched his new brand, and by 1968 he had built up enough of a rapport with customers that he was able to leave the CPA life behind. Nike has built its success on celebrity and athlete-endorsement deals, starting with running prodigy Steve Prefontaine in 1973 and continuing with one of the most successful shoe marketers of all time in Michael Jordan. Nike signed him to a five-year endorsement deal in 1984 worth roughly $500,000 per year. The biggest NBA star today is still under the Nike roof, with LeBron James signing a lifetime contract with the brand in December for an undisclosed sum. Though Knight announced plans in June to step down as Nike chairman, he’s leaving the $30.6 billion — in sales — company in better shape than ever, with the stock and revenues at all-time highs. The second-richest person in China, Alibaba founder and executive chairman Jack Ma reportedly started China’s first internet company in 1988: China Yellowpages. He lost control of that company to a state-owned telecom in 1996 and started Alibaba three years later with just $60,000. Fifteen years after its inception, the e-commerce company broke records with a $25 billion initial public offering — the world’s largest ever. Additionally, Ma plans to push Alibaba outside of China and significantly expand its ventures abroad. He got in US President Barack Obama’s good graces after being interviewed about climate change and entrepreneurship by the president at the Asia Pacific Economic Cooperation Summit in November. Stefan Persson was born in 1947, the same year his father founded a women’s clothing store called Hennes. The Swedish entrepreneur expanded his business in 1968 when he acquired men’s clothing store Mauritz Widforss, forming Hennes & Mauritz — H&M. Six years later the company went public, and in 1976, after earning degrees from the University of Stockholm and Lund University, Stefan joined his father at the helm. He served as head of UK operations and shortly after succeeded his father as CEO. Over the past three decades, H&M has expanded its operations globally, now boasting nearly 4,000 stores in places like Hong Kong, China, Tokyo, Japan, Russia, and the US. In 2009, Stefan stepped down as CEO and the third generation — his son, Karl-Johan — took over the company, which had sales of $22.4 billion in 2014. Source of wealth: Inheritance, Mars Inc.
Siblings Forrest, Jacqueline, and John Franklyn “Frank” Mars inherited a stake in iconic candymaker Mars Inc. when their father, Forrest Sr., died in 1999. The notoriously private trio co-own but don’t actively manage the maker of M&M’s and Milky Way bars, which their grandfather started in 1931 as a confectionary business in his kitchen in Tacoma, Washington. In 2008, Mars Inc. branched out from chocolate to gum when it acquired the Wrigley Jr. Co. for $23 billion. Since then, it’s delved into pet food, buying Iams and two other brands in 2014 from Procter & Gamble for close to $2.9 billion. Together the three siblings run the Mars Foundation, which gives primarily to educational, environmental, cultural, and health-related causes. In March 2015, Frank Mars was made an honorary knight by Queen Elizabeth II. Bernard Arnault’s LVMH houses 70 luxury brands from Louis Vuitton to Hennessy to Dom Perignon, all controlled by family parent company Groupe Arnault. By the 1980s and ’90s, Arnault, who started out as a civil engineer, had assumed control of the family business and proceeded to buy high-end fashion house Christian Dior, reviving it from the brink of bankruptcy. Like most LVMH brands today, Dior once again thrives as an industry standard bearer, helping the firm haul in a record $33 billion in revenue in 2014. This year, the French chairman and CEO is joining US-based private-equity firm Catterton to form an investment firm with a consumer focus. The new firm, to be named L Catterton, is targeting $12 billion in assets under management and will be 40% owned by LVMH and Groupe Arnault. The daughter of late Walmart founder Sam Walton, Alice Walton holds a major piece of the company fortune, making her the richest woman on earth. Though she never took an active role in running the superstore like her brothers, she’s become the target of pushback from minimum-wage Walmart employees who view her highfalutin lifestyle as insensitive and ignorant to the plights of many workers. Instead of spending time at Walmart, Walton has become a patron of the arts. Her immense personal collection includes pieces by Andy Warhol, Norman Rockwell, and Georgia O’Keefe. In 2011, she opened the $50 million Crystal Bridges Museum in Arkansas, where a number of her famous paintings are on display. Walton also recently donated 3.7 million of her Walmart shares to the family’s nonprofit and put her Texas ranches — one a working horse ranch, the other a luxurious vacation spot — on the market for a combined $48 million. Samuel Robson “Rob” Walton is the oldest son of Walmart founder Sam Walton. He started working at the iconic retail behemoth in 1969, holding positions from senior vice president to general counsel to chairman, a role he stepped down from in June after 23 years on the job. His son-in-law was named his successor. Despite Walmart’s reputation as a greedy corporation that underpays its employees, the Walton family — the richest in America — has a philanthropic streak. Regulatory filings on New Year’s Eve revealed that he and his brother each gave away 1.5 million Walmart shares to the family charity, Walton Family Holdings Trust, while sister Alice gave away 3.7 million shares, for a total family donation of $407 million. It’s an incredible amount, but it’s also ultimately a drop in the bucket for the Waltons, whose stake in the company — about 50% — is worth nearly $100 billion. James “Jim” Walton’s parents, Helen and Sam Walton, purchased a controlling stake in Arkansas’ Bank of Bentonville the year before opening the first Walmart store in Rogers, Arkansas, in 1962 — when Jim was just 14. Within five years, the family owned 24 of the retail stores and in 1972 listed Walmart on the New York Stock Exchange. In 1975, after working in Walmart’s real-estate department for a few years, Jim joined his parents’ bank, later renamed Arvest Bank Group. He’s now chairman and CEO of the regional community bank, which has $15 billion in assets. The businessman is also director of Walton Enterprises, the holding company for the Walton family’s assets, and chairman of Community Publishers, an Arkansas-based newspaper firm. After the death of his brother John in 2005, Jim joined the board of Walmart, where he serves as a director today. While America’s richest family remains incredibly private, the Walton Family Foundation, of which Jim is secretary and treasurer, has donated millions to charitable causes. In December 2015, Jim and his siblings donated $407 million worth of Walmart shares to a newly formed trust that funds the Walton’s philanthropy, which focuses on educational, cultural, community-development, and social causes. At 17, Ingvar Kamprad founded IKEA, now the world’s largest furniture retailer with sales exceeding $33 billion. Kamprad’s plan from the beginning was to set up “eternal life” for IKEA, which meant keeping it off the stock market and securing it within a complex corporate structure that includes a charitable arm and a retail and franchise arm, collectively known as Stichting INGKA Foundation. While the Swedish business magnate is no longer directly involved in day-to-day decision-making operations, he still sits in on meetings as senior adviser to the supervisory board. Among his peers, the 89-year-old founder is incredibly frugal despite his massive net worth. He reportedly flies economy, stays in cheap hotels, and has driven the same Volvo for more than two decades. He also infamously moved IKEA and his family out of Sweden in the 1970s to avoid its onerous tax rates. He returned to live in his home country in 2013 after a long spell in Switzerland. But Kamprad has also been generous with his wealth, donating to child rights, immunization, environment and wildlife, education, and medical research, with personal lifetime giving of $300 million. Jeff Bezos earned his massive fortune by introducing e-commerce to the world. After spending time in finance on Wall Street, Bezos founded Amazon.com in the garage of his Seattle home in 1994 and operated it exclusively as an online book retailer. The company went public three years later and has since grown to include everything from furniture to food to Amazon’s own consumer-electronics products, generating $89 billion in sales in 2014. While Bezos, chairman and CEO, faced a barrage of negative media attention last year for reports that Amazon’s warehouses are high-pressure, toxic work environments — claims he disputed — the internet retailer continues to thrive with the growth of Amazon Web Services, the company’s cloud-computing branch, and a bold plan to conquer India’s “trillion dollar” online-retail market. Bezos also has interests outside of Amazon, including investments in his privately owned space company Blue Origin, which successfully launched its first spacecraft in 2015, and The Washington Post, the newspaper he bought in 2013. And early this month he invested millions in a company that’s creating a simple blood test to detect every form of cancer. With a net worth in excess of $66 billion, Amancio Ortega is the second-richest man in the world thanks to his control of the Spanish fashion behemoth Inditex, which Ortega — who started out as a delivery boy for a local clothing store at 14 — turned from a small-town dress shop into one of the largest fashion empires on the planet. His rising wealth is tied to the spike in the growth of Inditex, which saw its stock rise 34% last year. Sales were up 16% and profits increased 20% for the first nine months of 2015, and the company opened 230 new stores across 48 markets. Much of this success can be attributed to fast-fashion giant Zara, the company’s biggest brand. The chain is changing the landscape of retail as its chic yet affordable designs continue to appeal to demanding customers who constantly crave new styles at low prices. Yet despite Ortega’s immense wealth, he lives humbly. The billionaire still eats lunch with his employees in the company cafeteria, and though he’s the richest person in the fashion industry, he sticks to a simple uniform of a white shirt and blue blazer. Posted on February 16, 2016, in Other. Bookmark the permalink. Leave a comment.